Is the brand's sudden reversal the end to this story, or just the beginning of a larger issue facing the world's whisky fans? I first heard about Maker's Mark decision to lower their bottling strength of their classic whiskey from 45% to 42% ABV a week ago. I was sitting in my kitchen listening to episode 411 (mp3 link) of Mark Gillespie's excellent Whisky Cast when, during his news segment, he read from Maker's press release announcing their decision in response to the tremendous global demand for the Kentucky whiskey. While at first I was surprised, my initial thought was that this move would only be panned by serious whisk(e)y lovers and hard-core Maker's fans. My belief was that the average Maker's drinker probably didn't realize the traditional bottling strength to begin with, and didn't pay close enough attention to whisky-related press to hear about the change. Furthermore, if Maker's COO Rob Samuels was correct, that at 42% ABV the traditional flavor profile was preserved — a claim I felt was dubious at best, and which I'll discuss later — the world of Maker's fans would continue drinking their whiskey without skipping a beat. However, as the following week showed, I was wrong. I was wrong, in a big way. My thought that the average Maker's Mark customer would never hear about this change was dashed the very next day as stories began popping up almost immediately in the New York Daily News, The Daily Beast, and even USA Today. The comments sections of those articles mirrored the outrage brewing on social media sites, which even included a Facebook page calling for a boycott of the brand in the wake of their decision. The coming week brought blog posts, angry tweets, customer backlash, and what surprised me the most, main stream media coverage; even political blogs panned the decision as illustrative of the sluggish economy, or as a wrong-headed response in a free-market economy. The story from spirits company Beam, owners of the Maker's Mark brand, unfolded clumsily throughout the week, and culminated in a great interview with Marker's Mark COO Rob Samuels by Mark Gillespie for episode 412 of Whisky Cast (mp3 link; begins at the 18:40 mark). The interview is noteworthy not for what Mr. Samuels said, but rather what he didn't say. Take a few moments to listen to the segment as I'll reference it at length later. "Since we announced our decision last week to reduce the alcohol content (ABV) of Maker's Mark in response to supply constraints, we have heard many concerns and questions from our ambassadors and brand fans. We're humbled by your overwhelming response and passion for Maker's Mark. While we thought we were doing what's right, this is your brand – and you told us in large numbers to change our decision. You spoke. We listened. And we're sincerely sorry we let you down ..."
This was a solid PR response to a certainly untenable position by the brand, which, as I type, is being heralded as an enlightened revelation the world over; however, even in the light of this change of course I'm still bothered by some of the answers Mr. Samuels gave Mark Gillespie during his interview. Specifically, when Mark asked why Maker's Mark's production dropped significantly several years ago (28:40 mark), the carefully worded response to how the change in ABV would affect the profile of Maker's Mark (35:50 mark), and why the company didn't seriously entertain the notion of raising their price in response of a drastic uptick in global demand (32:40 mark) — as the laws of Supply and Demand would dictate. First, one of the points Mark made during his interview was the fact that Maker's production dropped below one million cases a few years ago. This is a significant point, in that the drop in production coincided with the time period Maker's should have been distilling product which would have been ready for release around the time of this current shortage. The response from Mr. Samuels is that Maker's, which at that time was experiencing steady year-over-year growth, was simply evaluating the global market. What? Evaluating the market meant Maker's needed to lower production? Either the question wasn't understood, the answer was a dodge, or by some fluke of editing the exchange lost all meaning. The fact that the same answer was reinforced when Mark tried to followup makes me believe the answer was a dodge. Now, I'm not insinuating that the whisky drinking public need to know exactly what happened at Maker's Mark during those years that caused a drop in production, but the parrying of this legitimate question by blaming the global market was anemic. Mark continued his questioning by asking why they didn't stop production of Maker's 46, the brand's premium label, and shift to stock into the classic Maker's Mark to meet demand. The reply was that the shipments of Maker's 46 were insignificant and that cannibalizing that expression's stock wouldn't have made a difference. Well, according to the only data I've been able to find, Maker's 46 was slated to ship 26,000 cases when it was first released in 2010, and compared to the 1.2 million cases of Maker's Mark worldwide that certainly is a paltry sum. However, Mr. Samuels, in answering a later question, confirmed that by dropping the ABV by 3% would yield a net increase of 40,000 additional cases. So, the company was prepared to toss aside a 50-plus year tradition, and risk damaging the brand, in order to squeeze out an additional 40,000 cases, while at least 26,000 cases of Maker's 46 (which is bottled at a higher 47% ABV) was available. Second, throughout the last week Maker's Mark customers heard a consistent drumming from the company that no one would notice a difference in the quality of the product at 42%, but notice how the defense of the profile change was carefully worded during the interview. Near the 36 minute mark the line about keeping the flavor profile intact changed to keeping the flavor to "within our taste standards". What does that mean? Certainly Maker's Mark has a consistent standard to maintain, as do all mass produced whiskies, but then why not just say that this change wouldn't affect the flavor profile and instead that it's to keep it within their taste standard? I had mentioned earlier that I felt this explanation was dubious, and upon hearing the repeated notion of keeping it within a taste standard it reminded me of an old saying, "close enough for government work." What's a Free Market Between Friends? Finally, the comment I had the biggest issue with during the interview was Mr. Samuels' response to why Maker's Mark didn't simply raise the price and let the free market handle the shortage. The comment, which was made in the interview around 32:40, was that Maker's Mark was founded on a simple tenet: treat the customer like a friend and don't 'price gouge'. On the surface this sounds like a reasonable answer from a company that puts their customer first, but was this decision based on a forward thinking, customer-first business strategy? Consider for the moment that in the interview Mr. Samuels states that all of Maker's Mark's time and energy went into perfecting the new 42% product to within their taste standards. Again, this is a decision that could be perceived as being customer-first; however, what product was Maker's spending all of their time and energy readying to deliver to their customers; to serve to their 'friends'? It was admitted that some of the assembled tasting panel noticed a difference in the new bottling and Beam had made no public announcement that the price of Maker's Mark would drop accordingly after lowering the ABV. 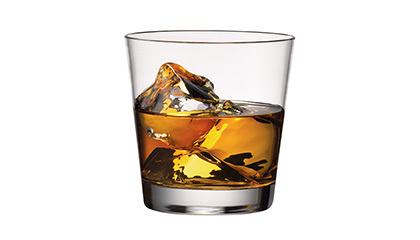 So, by all accounts Maker's Mark was preparing to hand a friend that ordered a bourbon neat a pour of Maker's Mark with a cube of ice and charge the same price. What a pal. Richard Paterson would kill you where you stand. To claim you won't price gouge your customers is very admirable, but delivering a lower quality product for the same price is, ironically, a form of price gouging. Wouldn't it have been more logical to simply raise the price and keep the quality the same, as the free market laws of supply and demand dictate? Mr. Samuels seems to confirm that Maker's Mark has room within the market to expand their pricing model, saying that while the brand is more expensive than some Bourbons it's less expensive than many. Beam even had a perfect case study on which to base such a decision — Knob Creek. In 2009, Knob Creek, another Beam brand, found itself facing a similar shortage. But, instead of sacrificing quality the brand went on the offensive and marketed the coming scarcity, using the shortage to build the expression into a premium whisky. 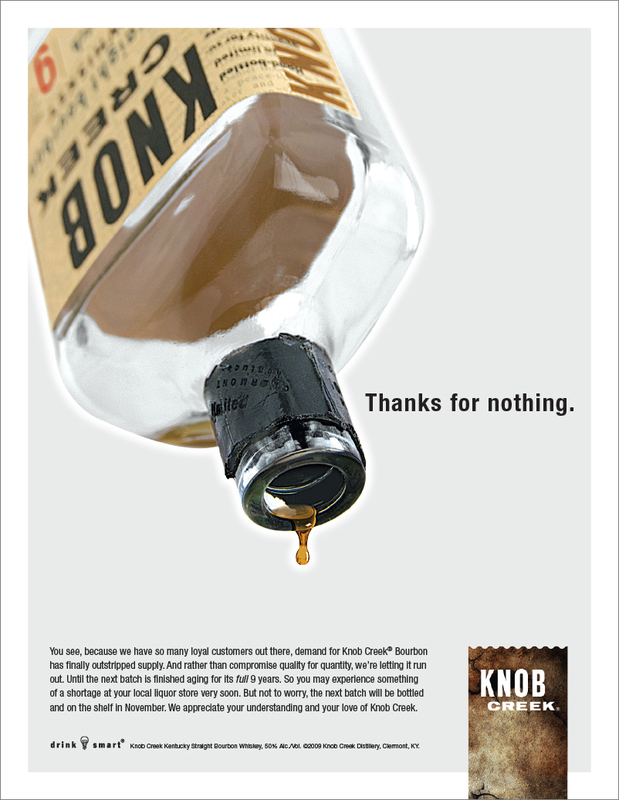 Knob Creek's 2009 marketing campaign, "Thanks for nothing." "Maker's Mark could have used their looming shortage as an opportunity to make their brand stronger. If they encountered sporadic shortages for a period of years, they could raise prices and leverage the scarcity to take the brand up a notch in prestige." Quality is paramount, but as long as it's kept within the ballpark it's okay to lower standards. Price gouging is bad, but charging the same price for less is fine. So, now that the dust is settling on this episode why do whisky fans, especially non-Bourbon drinkers, have cause for continued concern? The global demand is not lessening, with supplies of all whisky — not just the Bourbon category — being stretched thin, the trend with continue with more and more distillers having to face similar issues in the near future — if they aren't already. So, what will a global brand do in the face of a sudden scarcity of their product? After this week it's clear none of them will publicly announce plans to drop their bottling strength and face the ire of their base. Instead, companies will either continue to raise prices or simply switch to a lower ABV with their only notification to their customers being a new number on the label. Knob Creek followed the path of the free market and capitalized, and so we have to let our favorite brands know we're willing to wait for that special dram, and if need be pay a slightly higher price. We need to be prepared to show a lot of love to the distillers that choose quality over a short-term boost in supply, and have our pitchforks and torches at the ready for those brands that believe charging the same price for a lesser product is the only answer.